Servicing local and chain restaurants, caterers, grocers, coffee shops, delicatessens, food processors, and educational, recreational, and health care food service operations. We carry an extensive line of food service packaging and products to maintain high standards when it comes to practicality, safety, and presentation of your food items. Our abundant selection of disposable packaging and products from leading suppliers, such as Dart, Sabert, Darnel, Fabri-Kal, and are guaranteed to keep your foods looking great and tasting fresh even after they leave your store or restaurant. Need help finding a specific product or solution? Just ask! Our expert team can evaluate and recommend the most appropriate and efficient products to accommodate your usage, costs, portion and temperature control, and environmentally responsible requirements. Below lists only some of the wide range of food service, food processing, and restaurant supplies we deliver. Order online or contact us directly if you're looking for something specific! 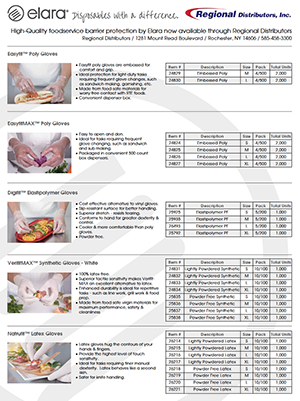 Comfortable and durable, Elara food service disposable gloves are manufactured with one thing in mind – keeping your business, staff, and customers safe. Elara's stringent specifications meet or exceed FDA and ASTM quality standards and their ingredients are safe for food contact. Click the chart to see which Elara glove is best for every task and budget. • Best glove for repetitive tasks such as line work? VerifitMAX Synthetic Gloves provide enhanced durability and is a great alternative to latex. • Best glove for frequent glove changes? Easyfit Poly Gloves are easy to put on and are perfect for light-duty tasks. • Best gloves for tasks that require finer manual dexterity? Natrufit Latex Gloves hugs hands and fingers and has the highest level of touch sensitivity. Did you know? For each case of Elara Foodservice Disposable products purchased, Elara provides a meal to an individual at risk of going hungry. Help Elara and Regional Distributors, Inc. fight hunger in America and order online today. 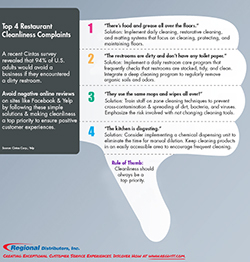 A recent Cintas survey revealed that 85% of U.S. adults would avoid a business, especially restaurants and hotels, if they read negative online reviews about the cleanliness of the establishment. Avoid negative online customer reviews on sites like Facebook and Yelp by following these simple solutions and make cleanliness a top priority to ensure positive customer experiences. #1 Complaint: "There's food and grease all over the floors." Solution: Implement daily cleaning, restorative cleaning, and matting systems that focus on cleaning, protecting, and maintaining floors. Recommended Product: MicroTECH Floorbac that is a one step process that effectively cleans the top surface of the floor, while leaving behind grease eating bacteria that digest build-up in porous tiles and grout. #2 Complaint: "The restrooms are smell and look dirty, and don't have any toilet paper." 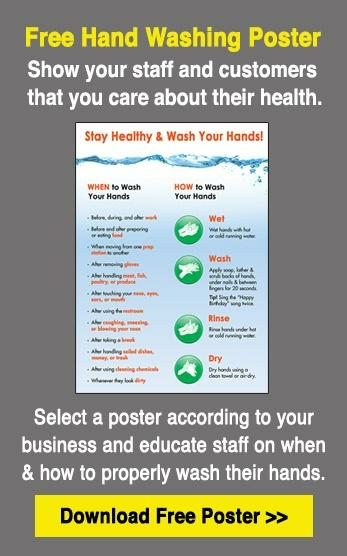 Solution: Implement a daily restroom care program that frequently checks that restrooms are stocked, tidy, and clean. 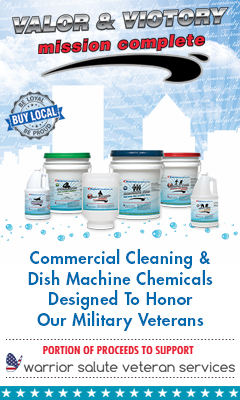 Integrate a deep cleaning program to regularly remove organic soils and odors. Recommended Product: I-Mop Autoscrubber Dryer. A major North American building service contractor (BSC) would take 18 minutes to clean their men's washroom 4 times daily. They shut down the washroom and redirected the men to the family washroom. The I-Mop cleaned the floor in less than 2 minutes, while keeping the washroom in use. Watch how >> Click image to enlarge. #3 Complaint: "They use the same mops and wipes all over!" Solution: Train staff on zone cleaning techniques to prevent cross-contamination and spreading of dirt, bacteria, and viruses. Emphasize the risk involved with not changing cleaning tools. #4 Complaint: "The kitchen is disgusting." Solution: Consider implementing a chemical dispensing unit to eliminate the time for manual dilution. Keep cleaning products in an easily accessible area to encourage frequent cleaning. Contact us today for more solutions and avoid negative online reviews about cleanliness. Restaurants use significant amounts of energy and water throughout an entire operation - from the back kitchen and refrigeration to the seating area and restrooms. As energy and water costs increase, investing in energy and water efficient practices and equipment are the best ways to protect your business against these rising prices. Energy efficiency is a sound business practice that improves profitability, reduces greenhouse gas emissions, and conserves natural resources. Investing in energy and water efficiency not only provides significant cost savings and utility conservation, but also unexpected benefits, such as increased customer comfort, better lighting, more repeat business, and increased employee productivity. 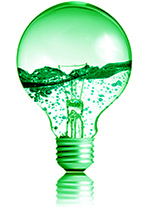 Follow the below simple steps to significantly conserve water and energy within your restaurant. Also see ENERGY STAR's cost-effective recommendations for restaurants for more tips and best practices. 1) Install a high-efficiency pre-rinse spray valve in your dishroom and save hundreds of dollars a year on water. Try Vari-Spray's Pre-Rinse Spray Nozzle that consumes 12% less water, sewage, and energy than the industry standard 1.42 gpm (5.4 L) nozzle equaling a $450 savings per year. Scroll down for more info. 2) Install ENERGY STAR qualified lightbulbs and light fixtures throughout your restaurant where appropriate. 3) Select ENERGY STAR qualified equipment, especially to replace large, expensive, worn-out equipment such as commercial dishwashers, cooking equipment, and refrigeration equipment. 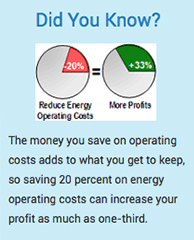 TIP: Check out the cost-saving benefits of ENERGY STAR Commercial Dishwashers. Depending upon the commercial dishwasher you select, you could save an average of $1,300 - $4,100 annually on utility costs. 4) Fix water leaks immediately, especially hot water leaks. Wasted water, sewer, and water heating costs can add up to hundreds of dollars a year. 5) Perform walk-in refrigerator maintenance. Check and replace door gaskets, clean evaporator and condenser coils, and check refrigerant charge. 6) Install new valve and aerator technologies on current urinals and faucets that significantly reduce water consumption and save thousands of gallons of water annually. 7) Use no-rinse floor cleaners and cleaning products, when possible, that saves water, as well as reduces time, labor, and costs. Contact us today to schedule an assessment and start reducing your restaurant's energy and water costs while helping to preserve the environment. Less than 1% of all water on Earth is useable by people. The rest is salt water or frozen. With the challenges to maintain healthy and affordable water supplies, it's vital to use water wisely and not waste it. Vari-Spray Pre-Rinse Nozzles, the only single-piece nozzle on the market (no welds = no leaks! ), are low-flow, consuming 12% LESS WATER, sewage & energy than the industry standard nozzle, equaling a $450 savings per year. Reduced Water Usage: Low-flow, consuming 12% less water, sewage, and energy than the industry standard 1.42 gpm (5.4 L) nozzle equaling a $450 savings per year. Fast Rinsing Ability: Infinite choice of spray patterns (soft hollow cone to a powerful solid jet stream) available at the squeeze of the trigger. Vari-Spray flow rate: 1.25 gpm (4.7 L) at 60 psi (4.1 BAR). Heavy-Duty: All stainless steel operating parts vs. industry standard plastic & chrome-plated brass. Durable rubber (no cracking plastic). Lowest Lifetime Cost: Buy one Vari-Spray for every three or four competitor’s nozzles in any 5-year period. 5-year warranty versus the industry standard of 1 year. 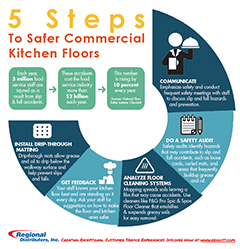 5 Steps to Safer Commercial Kitchen Floors. Each year 3 million food service employees are injured as a result from slip and fall accidents. These accidents cost the food service industry more than $2 billion each year. 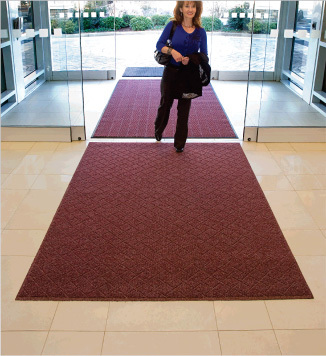 Keep your staff & facility safe with these 5 simple steps. 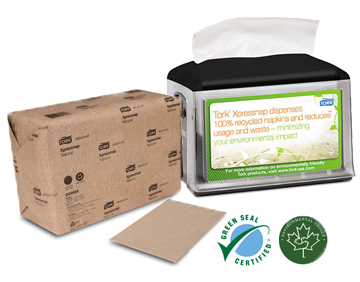 Xpress your brand with AD-A-Glance panels and reduce waste by 25% with Xpressnap Napkin Dispensers. Learn more. For each case of Elara Foodservice Disposable products purchased, Elara provides a meal to an individual at risk of going hungry. Based on the number of Elara cases Regional Distributors purchased in 2015, Elara made a contribution to Foodlink on behalf of Regional for over $1,725.00. Learn more. "Regional Distributors, Inc. has supplied excellent order accuracy and customer service at the Dinosaur Bar-B-Que for a number of years. Their team is more than just a supplier, they take a genuine approach to solving business concerns and cost savings. I appreciate our relationship and their dedication to us as a vendor." 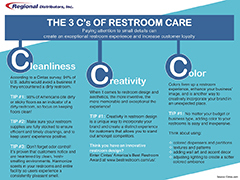 Learn the Three C's of Restroom Care - Cleanliness, Creativity, and Color - and simple tips to apply each!